Quantitative characters of plant community – A collection of organisms interacting directly or indirectly is a community. Within the community some species carry out similar functions or exploit the same resources. These groups are called guilds. For example, birds feeding mostly on insects make up an insect-feeding guild. A community may be autotrophic when it includes photosynthetic plants and gains its energy from sun; or heterotrophic which depends upon the organic material from other organisms. The community has attributes (features) the nature of the community is influenced by the interactions of species and their adaptations to the physical environment. These adaptations and interactions are reflected in such attributes of the community as structure, dominance, diversity and niches. Quantitative Characters: The characters that can be expressed in quantitative terms, i.e., can be measured. These include characters such as frequency, density, abundance, cover and basal area. The synthetic characters are those aspects of community which are based on analytical characteristics and utilize data obtained in the analysis of a number of stands. These describe the makeup of a community and include presence, constancy and fidelity. Ecologists classify communities in different ways, however all communities have certain characteristics that define their biological and physical structure. Biological structure of a community refers to number and relative abundance of species. A community can be composed of a few common species: or it can have a wide variety of species. When a single or few species predominate within a community, these organisms are called dominants. Relative Abundance: Relative abundance can be discovered by counting all the individuals of each species in a number of sample plots and determining their percentage. For example, a sample taken from a forest community contains 24 species of trees having a diameter of more than 10 cm. Out of these two species, let us suppose A and B, make up almost 44 percent of the total stand density. These species are designated as most abundant. The next four species, C, D, E and F make up about 5 percent of stand. These would be classified as next most abundant species. Species Diversity: Species diversity refers to both the number of species and relative abundance of individuals among the species. A community that contains a few individuals of many species is said to have higher divers. Differences in terrestrial communities are defined by the form and structure of vegetation. General appearance of vegetation is referred to as physiognomy. 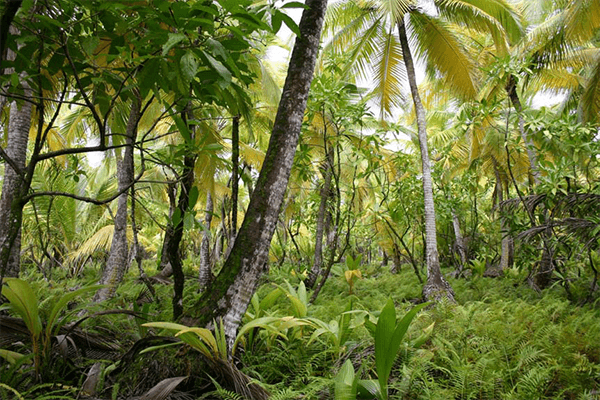 Vegetation may be classified according to growth form or life form. Growth Forms: The plants may be tall or short, evergreen or deciduous, herbaceous or woody. On the basis of these characteristics growth forms such as herbs, shrubs and trees can be recognized. These can further be subdivided into needle-leaf evergreens, broadleaf evergreens, broadleaf deciduous trees, thorn trees, and shrubs, dwarf shrubs. ferns, grasses. Chamaeophytes (Gr. chamia = on the ground): The plants species in which the perennial shoots or buds are present on the surface of the ground or 25 cm above the surface are classified in this class. The buds receive organic food from fallen leaves. These include plants growing in cool and dry climates. Hemicryptophytes (Cr. Hemi = half + kryptos = hidden): This class includes plants whose perennials buds are present at the surface of the ground where they are protected by soil and leaves. Many such plants have rosette leaves and are found in cold, moist climates. Cryptophytes (Gr. kryptos = hidden): The class consists of species with their perennial buds buried in the ground on a bulb or rhizome, where they are protected from freezing and drying. Such life forms are found in cold, moist climates. Epiphytes (Gr. upon): The plants growing on other plants with roots up in the air are included in this class. Such a system of classification provides a standard means of describing the structure of a community for the purpose of comparison. Each community has distinctive vertical structure. In terrestrial communities, the vertical structure is determined by their size, branching and leaves which influences and is influenced by the vertical gradient of light. Canopy (Autotrophic Layer): It is the primary site of photosynthesis and has major influence on forest. If it is open, considerable sunlight and water will reach the lower layers, and if it is dense the understory and shrub layers are poorly developed for want of light and water. Understory: It consists of young trees and tall shrubs and their survival is subject to the density of canopy. Only shade tolerant species grow better in this layer. Understory species may replace the canopy trees after their death. Shrub Layer: It is the layer, formed of shrubs and small, trees and is usually poorly developed. Herb or Ground Layer: The nature of herb layer depends upon moisture, slope position, the density of the canopy. 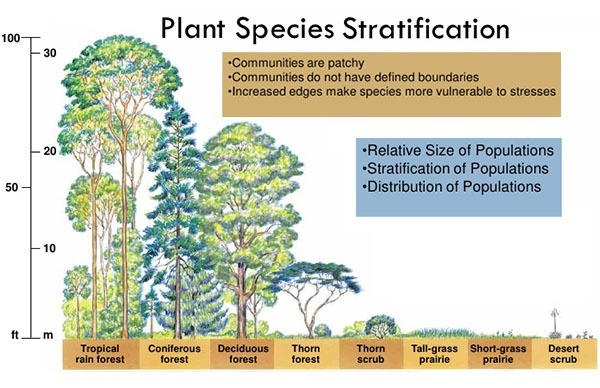 The species composition vary from place to throughout the forest. 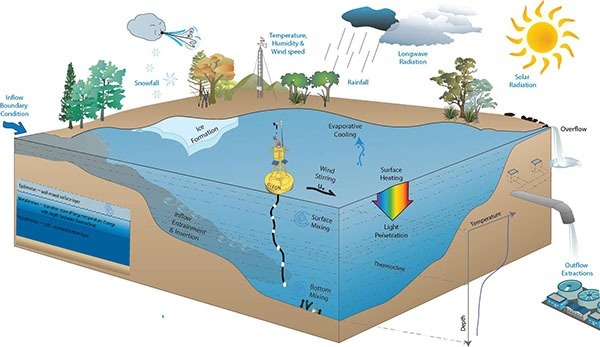 Aquatic ecosystems such as lakes and oceans have both vertical and horizontal strata (layers) determined by light penetration, photosynthetic activity and in response to water depth. The horizontal zones are obvious to eye; and vertical zones being influenced by light penetration. are not visible. Epilimnion: It is layer of freely circulating water. Metalimnion: it is layer of water characterized by a steep and rapid decline in temperature. Hypolitnnion: It is deep, cold layer of dense water about 4°C, often low in oxygen and a layer of-bottom mud. The horizontal zonation is characterized by presence of submerged, floating and emergent vegetation. These zones develop in response to water depth. Communities also possess a heterotrophic layer comprising of animals. The degree of vertical layering has a pronounced influence on the diversity of animal life in the community. A strong relationship exists between degree of vertical layering and bird’s species diversity. Increased vertical structure means more resources and living space and a greater diversity of habitats. For example, grasslands with few strata support only six or seven, whereas a forest supports many bird species. Horizontal patches reflect physical changes in the environment such as soils, disturbance, light, moisture, and nutrients. Horizontal patchiness of plant life influences the distribution and diversity of animal life. The dispersion of populations within a given area is characteristic for a community. The dispersion patterns of the populations reflect the interactions among individuals within the community, both intraspecific and interspecific.